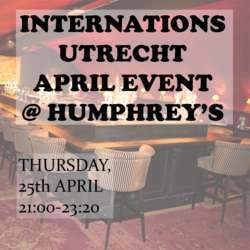 Come join us for some drinks and fun to set the mood for the upcoming King's Day festivities. This time, we are meeting on a Thursday evening instead of Friday due to King's Day eve. We'll be meeting at Humphrey's again and look forward to meeting you well. We have reserved the large bar area for our event (keep walking towards the back to find us there). Everyone who arrives by 22:30 will get a chip for a free welcome drink (wine, beer, or non-alcoholic). In the spirit of "the more, the merrier", we encourage you to bring along your friends, partner, or co-worker. So mark your calendars and let's get together on 25th of April! See you there. Please note: as we don't have a card reader, we only accept cash at the entrance. We would really appreciate that you bring change.